The center not only serves as a nexus for research and education, but also enjoys strong collaborative engagement with professionals from the engineering and scientific disciplines. C2E2 faculty strives for the transformation of “Science to Systems” by taking theoretical and laboratory expertise and applying it to industrial challenges. 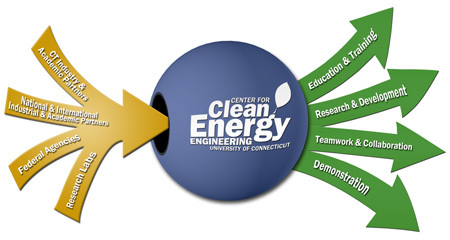 The center’s professional partnerships catalyze the advancement of public and industrial development of cost effective and timely clean energy solutions. These industrial partnerships not only facilitate the creation of a global “Sustainable Energy Economy,” but also enhance the real-world applicability and relevance the center has for its faculty and students. C2E2 also believes that education continues through ones career and as such, strives to meet the needs of our industrial partners as they continue to enhance their employee’s skills. This education of the professional workforce is uniquely catered to their specific needs and may include sessions such as: 1) focused training at a customers site for the specific interests of the participants, 2) the customized training of an entire company’s workforce to facilitate their understanding of the technology, 3) the offering of a portfolio of evening and semester long courses at our industrial partners sites and 4) offering tours, workshops, and organizing conferences. Finally, the center strives to act as a portal to the university community and through organizes meetings and seminars open to for full day training programs , to spending a morning at various sites discussing topics of interest , and working with high math and science teachers and providing them with an understanding of the application of some of their coursework. To become involved with the center or to receive more information about our industrial partnerships, please contact the C2E2 Director.